Not too far from where I live, overlooking the west bank of the Mississippi, is the Danish American Center–where Danish heritage is celebrated. (Though happily not celebrated in the manner seen in the country’s most famous export, The Killing.) 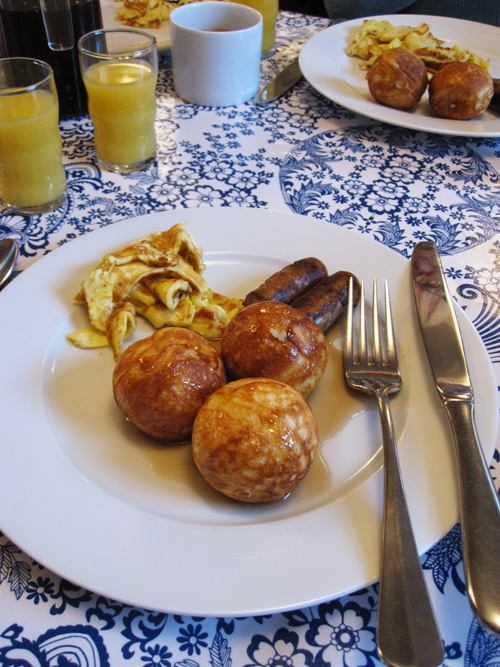 On one Sunday morning a month, through the cold seasons, the center puts on a Danish breakfast featuring ebelskivers. Think church pancake breakfast without the church. What in the world are ebelskivers? you ask. Well, ebelskivers are simply Danish spherical pancakes, as you can see on my breakfast plate this morning. They’re fried in special pans and take a little bit of skillful touch to make. The very friendly volunteer waitpeople at the Danish center will keep bringing your ebelskivers and eggs and sausage until you whimper “Uncle” or your stomach bursts. Are they better than plain old pancakes? Not really, but they still taste darned good and the $8.50 all-you-can-eat breakfast is a pretty fine deal. You betcha. You can track down the ebelskiver schedule at http://www.dac.mn/. So why a post on ebelskivers? I’ve got a soft spot for them, since they figure importantly in my canine cozy mystery, The Karma of King Harald. It’s by hunting down a legendary ebelskiver recipe that my hero Andy Skyberg identifies the serial killer haunting Beaver Tail county. 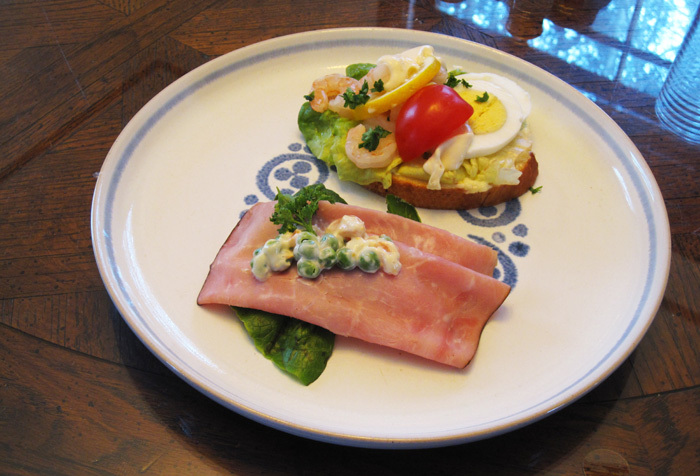 On the way out of the Danish American Center, Sue and I also happened across a caterer who was selling those scrumptious little Danish sandwiches, aka smørrebrød. Well, we couldn’t resist.